Al Shamal Doha (D1) strengthened their roster with addition of 29-year old American guard Aaron Mitchell (188-86kg-89, college: Longwood). He played last summer at Al Nizwa in Omani D1 league. 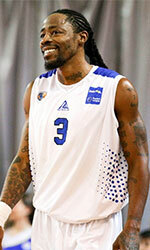 Mitchell also played for Sariya (PBBA) in Palestinian league. He was voted Asia-Basket.com All-Gulf Coast Championships Honorable Mention in 2018. Mitchell is quite experienced player. Thanks to his pro career he managed to play on four different continents (Europe, Asia, Africa and of course North America) in five different countries. Mitchell has played previously professionally in Iraq (Al-Tadamoun), Kosovo (Bashkimi), Montenegro (KK Centar Bijelo Polje and Teodo Tivat), Tunisia (Dalia Sport Grombalia) and ABA (Richmond Elite). He attended Longwood College until 2011 and it will be his eighth season as a professional player. The scouts decsribe him following way: Aaron Mitchell is known as a player that works hard on the court and off the court. Big and strong performer, known for his scoring ability and a tremendous drive to the basket. He posseses excellent athletic ability. As a left handed player, it is very difficult to guard him. He makes other players better with his excellent ability to assist.